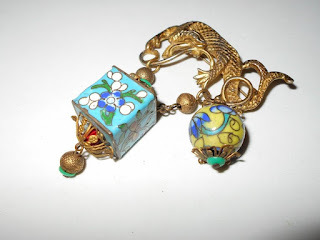 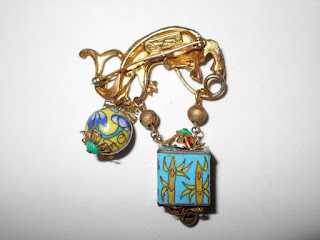 A former post connects certain Chinese cloisonne beads with costume jewelry designed by Louis C. Mark for the Rice Weiner company. 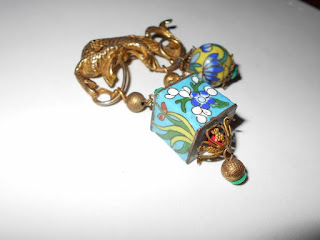 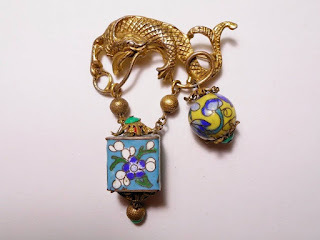 eBay vendor sarahjean.860 has discovered an interesting brooch that uses a dragon similar to one found on other brooches clutching a big cloisonne bead "egg." The cubic bead with floral and bamboo patterns seems to be very rare. 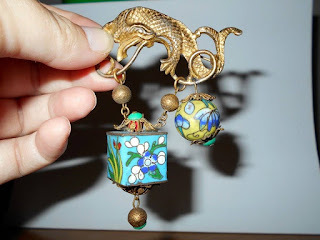 Unlike many costume jewelry pieces from this era, the cloisonne beads have been suspended so that they do't clack against one another, thus are in comparatively fine condition.